Nissan brought excitement to over thousands of fans at the recently concluded Delhi Auto Expo 2016. The announcement of the iconic GT-R sports car and the new X-Trail Hybrid crossover’s India launch attracted tremendous interest thanks to their prominence in Nissan’s global line-up. Nissan confirmed GT-R would be coming to India in September 2016, with X-Trail to follow in the 2016 financial year. Bollywood star and passionate petrolhead John Abraham was named brand ambassador for Nissan’s standout models coming to India. Affectionately known as ‘Godzilla’, the Nissan GT-R is the ultimate expression of performance and a masterpiece of technology and craftsmanship. GT-R is one of the most potent sportscars in the world. The new X-Trail Hybrid crossover brings Nissan’s latest hybrid vehicle technology to India for the first time. India will be the fourth market in the world after Japan, Thailand and Indonesia where Nissan will have introduced the X-Trail Hybrid. 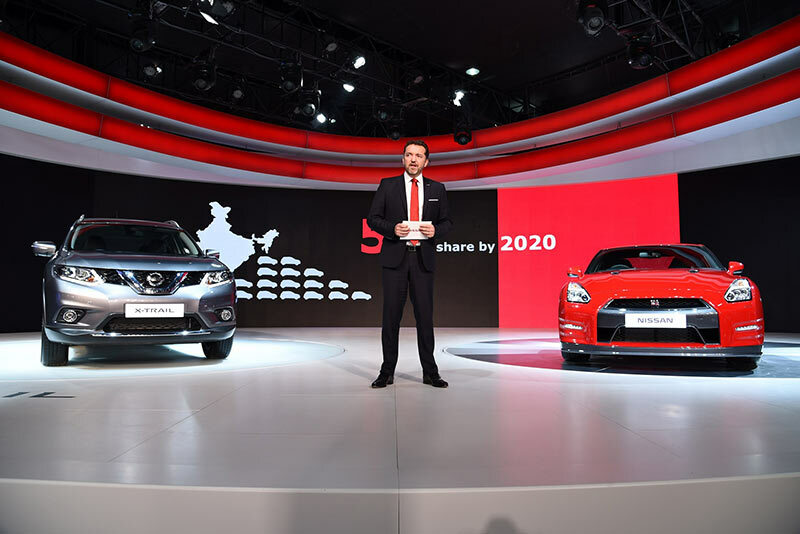 The introduction of these remarkable products from the Nissan global line-up will enable more choices for customers in India. The GT-R and X-Trail Hybrid will complement Nissan’s extensive ‘home-grown’ product range of Indian-built models from its plant in Oragadam, near Chennai. Cricket enthusiasts were treated to a special zone created at the stand for them to showcase their batting skills. Nissan signed an eight-year global sponsorship deal with the International Cricket Council through 2023 and is sponsoring the ICC T20 World Cup. To commemorate what could be 2016’s biggest sporting extravaganza, Nissan introduced cricket-themed limited editions of the Micra Active and Terrano. The cars were launched to mark the excitement for the upcoming ICC World Twenty20 2016 in India tournament. Famed cricketers Mohinder Amarnath and Zaheer Khan kicked off the launch of the ICC Micra Active and ICC Terrano by meeting showgoers and taking part in cricketing attractions designed to bring the game closer to fans. The event was in advance of the ICC’s eight-city trophy tour across India. Also at the Nissan stand, technology buffs could see future automotive possibilities via Nissan’s advanced EPORO robots, which were in India for the first time. These robots are designed to travel in a group that mimics the behavioural patterns of a school of fish by avoiding obstacles without colliding with each other. The high-tech EPORO robots feature collision avoidance systems that can be applied to the next generation of automobiles and demonstrate the future possibilities of driving in Nissan’s autonomous drive programme. Additionally, Nissan also reached out to brand enthusiasts via special digital engagement initiatives. With #MomentsThatCount, #MeetTheLegend, #NissanPavilion the brand attracted a combined online reach of 603 million. There were 65,000+ mentions on twitter by 12000+ users. The #MeetTheLegend contest enabled 10 winners to be among the first fans in India to get up close and personal with Nissan’s outstanding models. In addition, Nissan engaged with fans at the pavilion by enabling them to share their excitement with friends the world over using unique selfie photos on a real-time basis. A series of real-time video content was generated to enable people to watch the action at #NissanPavilion. All these videos can be watched on the NissanIndia YouTube channel. The action at #NissanPavilion attracted interest from users and made it trend on twitter almost all days during the Auto Expo.